Suriya is never into the commercial format and he preferred doing challenging roles and action dramas with high voltage action episodes. His performance received critical acclaim all over and Suriya is far from controversies and he prefers to stay united with other actors. He is the son of famous actor Shiva Kumar and Suriya’s brother Karthi too is entertaining the audience as an actor. Suriya teamed up with talented director Hari who is quite capable of directing cop dramas loading with a huge dose of action. He narrated the script to Suriya for which he has given his nod. The first installment released on May 28th, 2010 and the movie ended up as a huge hit in Telugu and Tamil languages. KE Gnanavelraja produced the movie on Studio Green banner and Anushka Shetty played the female lead. Prakash Raj played the negative lead in the movie which ended up collecting 4 times to the budget on which the movie has been made. The movie has been remade in Hindi with Ajay Devgn and Rohit Shetty directed the film. After a successful first installment, Suriya and Hari joined hands after three years for the sequel. The movie has been titled as Singham 2 which released on July 5th 2013. Anushka Shetty, Hansika played the female leads in this action entertainer and Devi Sri Prasad composed the music. Suriya’s terrific performance made the movie end up as a blockbuster all over. The movie has been dubbed into Telugu, Malayalam and Hindi languages. S Lakshman Kumar produced the movie on Prince Pictures. 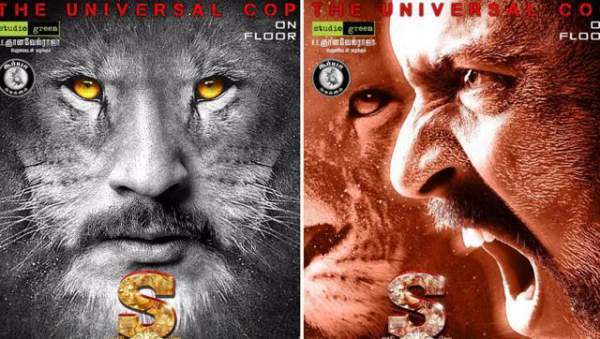 Now after a gap of three years, the duo are back with the third installment and the movie has been titled as Singham 3. Hari will direct the movie and the regular shoot of the film started from yesterday. Hari is quite confident on the script and the first look posters of the film have been released on the occasion of the movie’s shoot. Suriya has been super stunning in the released posters with a tagline Universal Cop. The regular shoot of the movie started in Vishakapatnam and will take place there for 2 weeks. Anushka Shetty will reprise her role in the film and Sruthi Haasan has been roped in to play an important role in the movie. Sruthi Haasan will be seen as an young cop in Singham 3 which is being produced by Suriya on 2D Entertainments banner. Devi Sri Prasad who composed the music for the first two installments has been replaced with Harris Jayraj for Singham 3. The movie will complete shoot and will hit the screens during December this year. Don’t forget to share and stay tuned for latest movies’ news.